A man and a woman, believed to have eloped, were gunned down in Muzaffarabad, Azad Jammu and Kashmir on Friday by three unidentified assailants in what is being treated as a case of ‘honour killing’, police sources said. Forty-six-year-old Sarfraz Khan — a labourer hailing from Swabi but a resident of Karachi according to his CNIC — and an unidentified woman accompanying him had arrived at the house of Chaudhry Maqsood, a former employer of Sarfraz’s, a few days ago. Upon arrival, Sarfraz had introduced the said woman as his wife to Maqsood, at whose place Sarfraz used to stay occassionally. The couple was strolling in the yard of Maqsood’s house around Friday noon when three assailants on a motorbike approached them. Seeing the men, the couple retreated into their room and locked it from the inside. 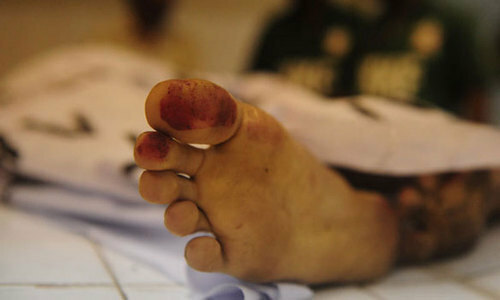 The commotion startled Maqsood’s family, who were told by the alleged attackers to stay calm no harm would come to them. The trio soon managed to beak open the door, after which they sprayed the couple with bullets, killing them on the spot. According to Additional Superintendent of Police (ASP) Muhammad Asif Durrani, the couple were hit by 14 bullets between themselves. The police recovered a mobile phone from Sarfraz’s body, with the only contact in the device being a certain Nazakat, another former employer of Sarfraz, whose house he had helped build and stayed at occasionally. Upon contacting Nazakat, it was learnt that a woman claiming to be Sarfraz’s first wife had paid him a visit, asking his whereabouts. Police further said Sarfraz’s ex-wife was also accompanied by the slain woman’s brother.